Anyone who does not follow the rules will be disqualified. No one is allowed to start the race without the required gear. Be Safe, Have Fun, Be Nice. Being SAFE means being VISIBLE – do not take shortcuts. No littering. This includes human waste. No outside help is allowed by crews, family, friends – imaginary or real, enemies or otherwise. If you have family/friends watching the race – make sure it does not appear they are offering support. Please explain this to them prior to the event. Spectators need to obey traffic laws and park safely out of roadways/traffic. Catching a ride on a snowmobile or vehicle is not allowed. Getting into a non-race volunteer vehicle is not allowed. Pacers are not allowed. Racers may help other racers. Checkpoint volunteers may assist you at the checkpoints. Patronizing local businesses is encouraged and in that respect racers may use product/services of local businesses as long as no race rules are broken. If you want to stop and purchase a pizza at a bar, warm up and throw down a beer, go for it. But no assistance by crews/friends/family. Feel free to contact us with questions. Respect other trail users – be aware that snowmobilers using the trail may not know about the race, may not see you and might be going very fast. MOVE OFF the trail any time they are approaching. Participants are required to MOVE OFF the trail when stopped. No matter how quick your stop is. Do not stop and remain in the trail. Ever. Even for just a second. All racers MUST check in & check out at ALL of their respective checkpoints along the course. Make sure the volunteer takes your race number. No camping. Bivy sacks and sleeping bags are required for a safety precaution. If you feel it is necessary/emergency, be safe and use them, off the trail of course. NO LITTERING. This isn’t a road race and we don’t have an army of sweepers to pick up trash. Don’t be a bad ambassador of your sport by leaving your empty gu/chomp/burrito wrappers/toilet paper on the trail. If you see trash on the trail, stop and pick it up, even if not yours or non-race related. It will give you a warm fuzzy feeling to know that you are a good person and you will get 1 minute off your finish time. Race directors AND their volunteers have the discretion to implement and interpret the rules as they see fit. The race directors’ decision is final. Gear check will happen at the check-in on the eve of your race. All requirements below are applicable to the start, duration and finish of the race. Finish line gear checks will be done. Sleeping bag – Zero (0) F degree or lower. However, it can be colder overnight so we recommend a colder rating than 0F. The sleeping bag must be labeled. No exceptions. If your sleeping bag isn’t labeled, find another one. Bivy sack The bivy must be closed on at least 3 sides. Blankets, tarps, or bivies made from space blanket material are not allowed, including the SOL Emergency Bivy. We recommend a durable, breathable, waterproof material that will keep you dry and provide warmth, and not tear easily. Tents are not allowed. Stove. To melt snow for water. Or cook a gourmet freeze dried meal. Fuel – 4 fl. oz. (either gas, alcohol or 1 canister of propane/butane 100 grams or 6 Esbit tablets). Must finish with these minimum fuel requirements, plan accordingly. Pot or container to melt snow (min. volume is 1 pint). Headlamp/bike light or flashlight. Light must be switched on during hours of darkness when encountering motorized traffic. We understand that some racers like to travel under the stars without their headlamp on: it is OK to switch off your headlamp while on the trail, but you must have battery power at all times so that you can switch it on before encountering motorized traffic, i.e., if you hear a snowmobile SWITCH your light ON. Suggest minimum ~100 lumen + batteries for the the 12 hours or 24 hours depending on how long you will be on the trail. Do not skimp on batteries. Stay alert and be safe. Being SAFE means being VISIBLE. 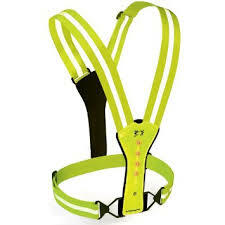 $30 cash – carry this on the trail at all times in the event a race official is required to give you a (good quality) replacement red LED light. We would prefer to do this than disqualify you! At least 20 square inches of reflective material, 10 front and 10 back. This is not just something we thought would be fun. It is meant to lessen the chance of you getting run over by a snowmobile on the trail or car at one of the road crossings. You will lose in a 70 mph collision. The more visible you are, the better. 3000 calories – all racers must have 3000 calories of food on them at all times, including at the finish line. (tip: pound of butter or jar of peanut bar is approximately 3000 calories). Race directors AND their volunteers have the discretion to implement and interpret the gear requirements as they see fit at check-in and during the race. The race directors’ decision is final. Cell Phone – We request that all racers carry a cellphone. Coverage is spotty among most cell carriers, but may be useful for us to find you if you don’t show up as expected. Do not call us if for anything less than a medical emergency. We are not set up to come get you if you decide you want to drop in the middle of the woods. Get yourself to a checkpoint if at all possible. Helmet strongly recommended for bikers. Extreme conditions mittens, head gear and outerwear, including waterproof items. 30 degrees and rain/snow can be the most difficult of conditions once you are wet. Down/synthetic sweater, spare undershirt/socks etc. Duct tape, Vaseline, sunglasses, lip-balm, moleskin, ibuprofen, etc. Lots of food. Preferably items which remain chewable at way below zero. Sleds or backpack for runners skiers. Assorted tools/waxes as needed. Judge your gear based on your mode of transport and skills. Look at the results from the prior years to estimate times. Be aware that you may be out there for a long time, in temps below zero F, or wet conditions, and assume that you won’t have any help. If you need to sleep on the trail for a night until we figure out you are in trouble, make sure you can survive.